river valley… we could have stayed here forever." the sights, on our list….we'll be back!" Nestled in the Dordogne-Lot region of southern France, St. Cirq Lapopie is surrounded by the lush green hills, the fertile river valley, the sunflower fields, the fruit orchards, the vineyards, the canyons, everything that characterizes the magnificent French countryside. 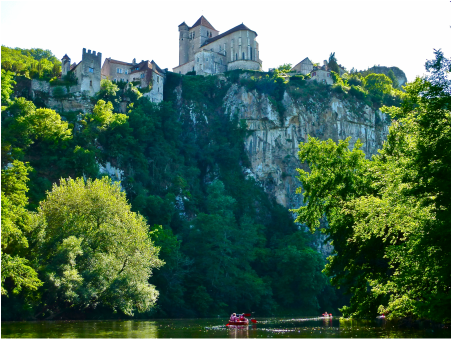 Yet the area, officially known as Le Quercy, is a wordly region too, with nearby towns and villages, of markets and museums, of ancient caves and modern wineries, of medieval cathedrals and haute cuisine, and of a history many centuries old. Under the Romans Quercy was part of Aquitania prima, and Christianity was introduced during the 4th century. Early in the 6th century it fell under the authority of the Franks, and in the 7th century became part of the autonomous Duchy of Aquitaine. At the end of the 10th century its rulers were the powerful counts of Toulouse. The exploits of Richard the Lionheart towards the end of the 12th Century are the stuff of local lore, particularly his defeat in trying to conquer the village. During the wars between England and France in the reign of Henry II, the English placed garrisons in the county, and by the 1259 Treaty of Paris lower Quercy was ceded to England. The monarchs of both England and France confirmed and added to the privileges of the towns and the district, each thus hoping to attach the inhabitants to his own interest. In 1360, by the Treaty of Bretigny, the whole county passed to England, but in 1440 the English were finally expelled. In the 16th century Quercy was a stronghold of the Protestants, and the scene of a savage religious warfare. The civil wars of the reign of Louis XIII largely took place around Montauban. The village is on the edge of Le Parc Naturel Régional des Causses du Quercy. The Quercy probably derives its name from the Latin for “oaks”, which cover the local hills in rich, spindly profusion. It is a region of outstanding scenery, renowned for its rural calm, slumbering, medieval towns and fine cuisine, including the excellent, dark Appellation Contrôlée wines. 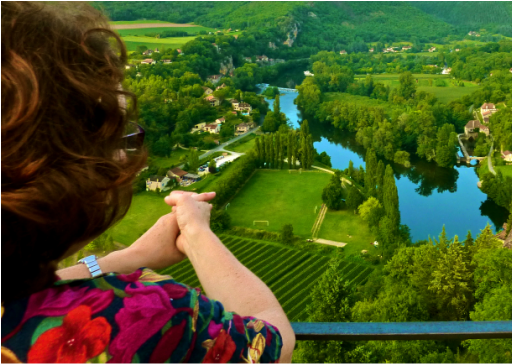 The nearest town is Cahors, one of only 130 sites across France recognized by the French government as "une Ville d'Art et d'Histoire" for the importance and quality of its heritage. West of Cahors, there are flat, valley-bottom vineyards set in dark, rich, red soil. To the northwest, one finds a gently undulating countryside of the Bouriane. The region’s landscape is diverse and varied. Near the village there are dramatic cliffs, prehistoric caves and rocky plateaux (causses). In the fields, one may often see ancient bories which are sheep herders' stone huts. The climate, too, is varied. Evenings throughout the season are seldom too hot, so sleeping is easy. In winter, there is plenty of sunshine, and cold nights often bring magical dustings of snow. 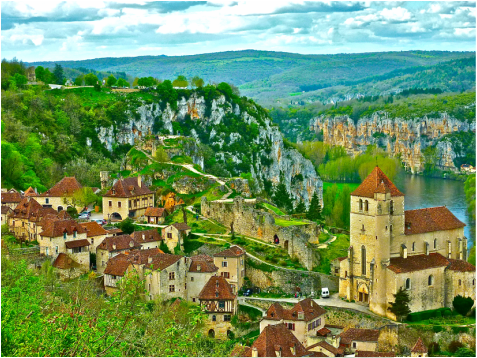 If you would like to know more – here are links to a few of many interesting websites on the region: Lot Tourism, Quercy Tourism, or Culture Vulture.